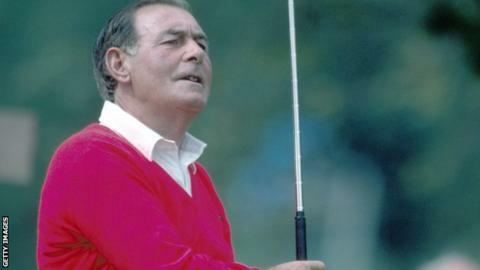 Former Irish professional golfer Christy O'Connor Senior died in Dublin on Saturday, aged 91. The Galway native won more than 20 tournaments on the Irish and British circuit and finished in the top 10 of The Open on 10 occasions. O'Connor competed in every Ryder Cup between 1955 and 1973 and was inducted into the prestigious World Golf Hall of Fame in 2009. He was uncle to Christy O'Connor Junior, who died in January aged 67. O'Connor Senior won the British Masters in 1956 and 1959 and his best finish in The Open was tied-second at Royal Birkdale in 1965, two strokes behind Peter Thompson. He often explained his chances of winning a major were greatly diminished by the fact he could rarely afford to travel to the United States. O'Connor Senior also played in 15 World Cups, winning in 1958 with Harry Bradshaw. He won six PGA Senior Championships between 1976 and 1983. Ryder Cup captain Darren Clarke said he learned the news with "great sadness". "Christy was in many ways the father of Irish golf and his death, so soon after that of his nephew, Christy Junior, means that Ireland has lost two Ryder Cup legends in the space of five months. "Christy Senior was a golf icon and a wonderful person as well. He did so much for the game he graced for many years while the Ryder Cup to some extent is what it is today because of his passion for it. "Irish golf in particular and golf in general has lost one of its greatest heroes."